I recalled that when talking to my son who recently started a new job in a new city, which involved a move from Canada to the U.S. He was telling me about his first pay check that had gone missing and about his experience of setting up a bank account. Before discussing the moral of the story, I will first describe my son’s encounters with non-thinking employees. Despite my son providing the electronic payment information immediately, the payroll staff mailed his first pay check to my husband and me—in Canada. Ours was still our son’s permanent address while he was securing an apartment in his new home city. Nevertheless, some thinking by the payroll staff would have made clear that mailing a check for an employee living in the U.S. to Canada didn’t make any sense. A quick email of phone call would have resulted in a more sensible solution, with no delays or extra costs. When setting up a U.S. bank account, our son encountered similarly unthinking staff. Our son’s debit card application was misplaced by a bank employee. It took almost three weeks of our son finally to obtain a debit card, which cost him Canadian currency conversion and bank fees. Moreover, the bank employee encouraged our son to apply for a credit card, which he did. But without any credit history in the U.S., his application was immediately rejected, resulting in a negative credit rating. Thinking on the job, and in every other aspect of life, is a virtue necessary for human flourishing. The purpose of every job is to contribute to the company’s productivity. Every employee who reduces the company’s overall productivity is a drain on its profitability and thus jeopardizes the company’s ability to produce values, provide jobs—and exist. There may be several reasons for the lack of productivity, such as poor or no training, improper supervision, or lack of incentives. But ultimately, an employee’s productivity, his ability to create value for the employer—which justifies his job and getting paid—depends on his thinking on the job. Thinking on the job, and in every other aspect of life, is a virtue necessary for human flourishing. 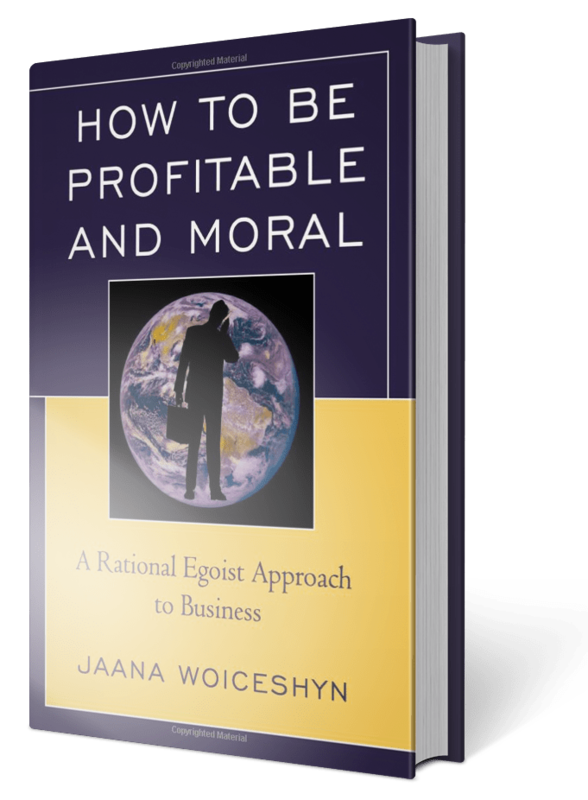 Ayn Rand identified it as rationality, the primary virtue we need to achieve our values and happiness, regardless whether we work as CEOs or janitors. Rationality means using reason: being focused on facts and adhering to them in one’s thinking and action. Using reason is the opposite of mental coasting: going about whatever we are doing by unthinking habit, whether sending pay checks to non-current addresses, misplacing information, or selling products to clients that clearly harm their interests—such as credit cards for which they are not qualified. There is no job that cannot be performed better by a thinking versus a non-thinking employee. A janitor who uses reason will continually look for and adopt better (faster, more efficient, and more effective) of performing his tasks—as would a CEO. Even work that is primarily physical, such as landscaping or garbage collection, is performed better by thinking workers. Thinking workers are assets to their employers, but rationality is also in their self-interest: doing one’s job well is a source of self-esteem and opens up opportunities for more challenging and rewarding work, as experience, knowledge, and skills expand. And as good job performance helps the employer be more profitable, prospects of job security and opportunities for promotions increase. Thinking employees mean satisfied, loyal customers willing to pay for the quality of products and services. But there is no guarantee that employees will think and act rationally, as our son’s recent experiences show. What can employers do, besides trying to hire “thinking carpenters,” to encourage employee rationality? There are three primary tools for achieving such a goal: a company culture that values rationality, incentives that reward it, and training that provides the knowledge and skills to perform a job properly. Culture, the shared values at the company, is the foundation on which the other tools rest. The shared values—such as the use of reason—must come from the top executives who live by those values, such CEO John Allison and his executive team at BB&T, the Fortune 500 bank, did. (See BB&T values here). Once a rational culture is established, setting up the requisite incentives and training is relatively straightforward. Setting up the culture, incentives, and training to encourage rational thinking at work is worth it, as evidenced by BB&T’s superior overall performance, based on its ability to attract and retain thinking, productive employees. It’s an all-around win-win set-up that benefits employers, employees, and customers alike. He should find a better bank to deal with, there’s no future with that one, they’ll make errors and be difficult to communicate with to correct them. I haven’t heard of a good one in the US recently, Wells Fargo had poor customer service and ethics problems. (While the (ir)responsible CEO and Chair came out of Northwest Bank which merged into WFB, customer service in recent years was handled out of the Carolinas – confused people, probably those partly responsible for the failure of a bank there that WFB got suckered into taking over. BBandT avoided that outfit, then received business from its unhappy customers who did not know much about Wells Fargo so switched to a name they knew. And your son might be wary of that employer. Of course many employers discourage thinking. And in some work environments, people “think” too much as goals are unclear, they aren’t helped, and are afraid of political blame – so they are afraid to make decisions. Even a good culture has to be monitored and reinforced. Scott Phillips of Starfish Medical in the Victoria BC area learned that one could deteriorate, he had to get it back fully on track. I’ve long said that even a labourer digging with a shovel has to use his mind to place the shovel well and adjust the approach when variations are encountered – always conscious. The first person who figured out that a shaped stick could make digging easier (than with hands or straight stick) then had a capital asset that improved her productivity. Perhaps she even scouted for good sticks and traded them to others for something they could make (such as a woven or carved basket) – she was then a business women. But Marxists deny the human mind, they peddle a hunter-gatherer paradise in which food is easily obtained. Thanks, Keith, for your comments! Oh, yes – there’s BBandT of course, it was expanding toward Texas.